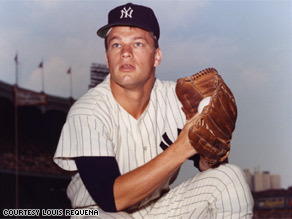 Jim Bouton was photographed as a rookie in 1962 at Yankee Stadium, before the renovation of the ballpark. EGREMONT, Massachusetts (CNN) -- I'll never forget my first day in The House that Ruth Built: April 9, 1962, the day before opening day. I made the team that spring as a non-roster player, having pitched in the Texas League (AA) the year before. And I had just turned 23. The Yankees had scheduled an afternoon workout, but I was so excited that I couldn't sleep and I drove in from my parents' house in New Jersey at 7 in the morning. After introducing myself to a skeptical guard, he led me down two flights of stairs and through a hallway, where I was greeted by the clubhouse man Pete Sheehy (who died in 1985 and for whom the room is now named). The Yankee clubhouse in 1962 was like a large subterranean living room. A wall-to-wall grayish green carpet muffled all sound, and the overhead lighting was subdued. Three walls of walk-in wood lockers faced a wall of large frosted windows that cast shafts of light from the street above. Everything was painted a muted gray green to match the carpet, including the exposed ductwork in the ceiling above. A cleat-dented wooden stool sat in front of each locker. And hanging in the lockers, with military precision, were the classic Yankee uniforms. "Your locker is right here by the door," said Pete. I couldn't help smiling when I saw Whitey Ford's nameplate just one locker away. I asked Pete if this was the same room that Babe Ruth and Lou Gehrig and all those guys used. He pointed to a locker across the room where he used to bring "a bi-carb and coffee" each day to the Babe. Then I grabbed my glove and went out to the field -- you know, just to get oriented. After sitting in the dugout a few minutes, I trotted out to the mound. Looking up at the three tiers of stands was like being in the Roman Coliseum. Of course, I had to toe the rubber and look in for the sign. Fortunately, at that hour of the morning, it was just me and the pigeons. What would it be like to pitch there when the stands were filled with people? My big chance came on May 7, 1962, in the second game of a double-header against the Washington Senators, in front of a real crowd that included my Mom and Dad, my brothers and a whole bunch of neighbors from New Jersey. I was thrilled and scared at the same time -- maybe a little more on the scared side. I walked the bases loaded with nobody out. Then I fell behind 3 and 1 on the fourth hitter. My next pitch was a little bit high and manager Ralph Houk stepped out of the dugout - either to calm me down or remove me from the premises. But the umpire, bless him, called it a strike and Houk stepped back into the dugout. The inning seemed to last forever, but I finally got out of it and ended up pitching a complete game shutout. Maybe the worst shutout in history - 7 walks and 7 hits. After the game Houk said to me, "any more shutouts like that and we're going to need a new bullpen." The best part was when I walked into the clubhouse after the game. I arrived a few minutes late because I'd done a TV interview in the dugout. And when I opened the door, there was a path of white towels leading to my locker -- and Mickey Mantle was laying down the last towel. This is my favorite memory of Yankee Stadium. Unless it was Mantle's 9th inning walk-off home run in '64 World Series that beat the Cardinals 2-1, which also happened to be my first World Series win. After that it was all down hill. In 1968 a sore arm got me traded to the Seattle Pilots for a bag of batting practice balls. That's the year I kept a diary that became Ball Four -- a book that also mentioned Mantle hitting a home run with a hangover -- which got me banned from Old Timers Day at Yankee Stadium for 28 years. My eventual return to Yankee Stadium came after my son Michael wrote a letter to the New York Times, saying the Yankees should let bygones be bygones and invite me back. It was such a beautiful letter the Yankees were embarrassed into inviting me. After 28 years, Yankee Stadium was a different place -- a strange and garish place. A makeover in 1973-75, under the new owner George Steinbrenner, added cantilevered stands that destroyed the elegant upper façade, and exterior elevators which spoiled the view of the of the lower facade. Inside, the grayish green carpet was now bright blue and featured a giant Yankee logo. The honest ceiling with its exposed pipes was now a dropped ceiling with stark white tiles. Everything was painted blue and white -- the Yankee colors, get it? Now, instead of restoring the stadium, they're going to tear it down. Raze the clubhouse where Pete Sheehy made coffee for Ruth. Destroy the dugout where Stengel slept. Bulldoze the field where Mantle roamed and level the mound where Larsen pitched the only perfect World Series game. And they're going to build an underground parking garage on the site! This will no doubt be "The Garage that Ruth Built" -- which could produce a reverse "Curse of the Bambino." If you check the current standings, you'll see this may already be happening.